COLLEGE FOOTBALL on ESPN was by far Saturday’s biggest cable draw, taking up 4 of the Top 5 slots and several more below that. The top 3 games were at 1.03-1.56, the latter more than tripling the next highest score of the day, which was also on ESPN, a NASCAR race at 0.47. The first non-sports show of the night was HELL ON WHEELS (AMC), up 0.08 from last week to 0.41. 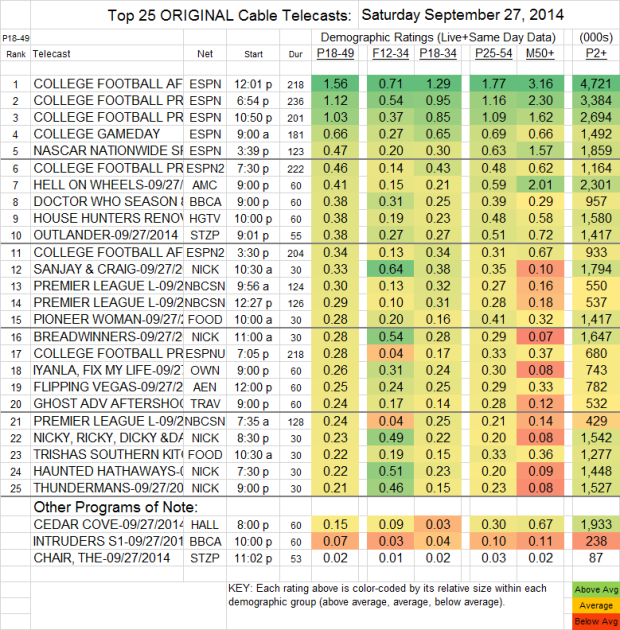 DOCTOR WHO (BBCAmerica) followed, down 0.03 to 0.38 (its companion thriller INTRUDERS slipped 0.01 to an even uglier 0.07). Starz’s midseason finale of OUTLANDER rose 0.06 to 0.38, but follow-up reality series THE CHAIR remained mired at 0.02. CEDAR COVE (Hallmark) slipped 0.01 to 0.15. In response to some specific reader requests: THE KITCHEN (Food) was at 0.19, with 1.2M total viewers, UFC PRELIMS (FS1) were at 0.29/700K, and EDDIE ALVAREZ (Spike) was at 0.17/460K.